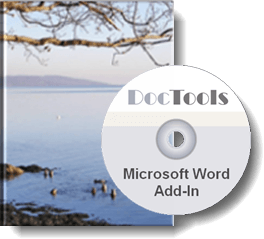 Below you will find an overview of the add-ins for Microsoft Word that are currently available. More Word add-ins will be added and existing Word add-ins will be updated when relevant. You can find the version number of the newest version of each add-in on the relevant product page in the Products menu. For an overview of the version history of each Word add-in, see Changelog. If you have one or more of the Word add-ins installed, you will find the version number of your installed version via the related About command in the Ribbon in Word. The Word add-ins are listed in alphabetical order. Click a Read More button to go to a product-specific page for an add-in. Click a Free Trial to get access to the trial version. Click a Buy Now button to start the secure order process for the add-in. TIP: For an overview of which versions of Word the Word add-ins work with, see Which versions of Word do the individual add-ins work with? at the end of this page. The specific page for each add-in includes version information about that add-in. Which versions of Word do the individual add-ins work with?